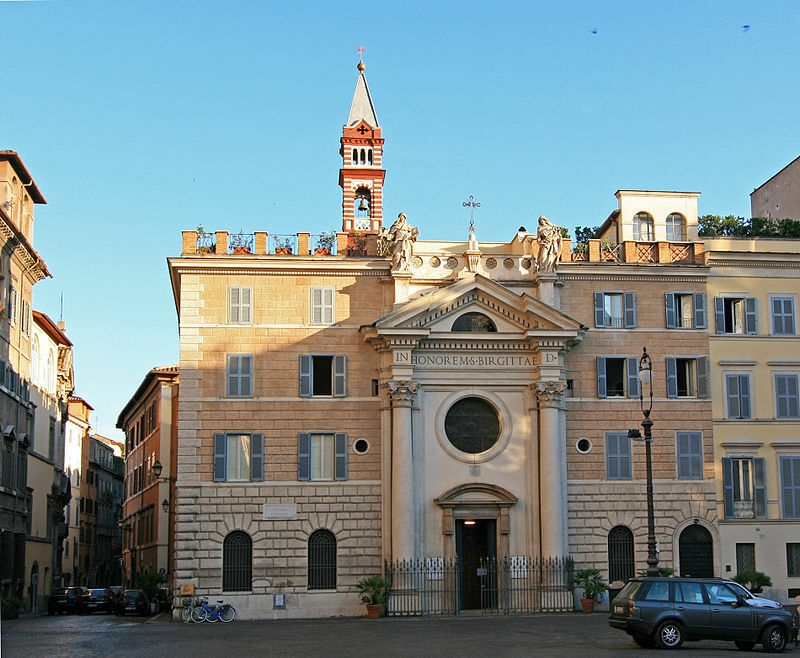 Elisabeth Hesselblad founded the Roman branch of the Order of Birgitta (also Bridget), now a worldwide religious order, which has been centred at the Birgitta house in Piazza Farnese in Rome since 1931. She was canonised in 2016. Elisabeth Hesselblad grew up in Fåglavik, Falun and Skövde in a family of twelve children. Her family was intermittently poor and the children had to play their part in providing for everyone. When she was 18 years old she emigrated to the United States of America. She settled in New York, where she trained to become a nurse and regularly sent part of her earnings to her family in Sweden, as they still required financial support. After various jobs she finally came to work as a private nurse for a Catholic Cuban family, the Cisneros, who brought her closer not only to the Catholic faith but also to convent life. One of the Cisneros daughters was a nun. After taking religious education lessons with the Jesuit father Johann Georg Hagen, Elisabeth Hesselblad joined the Catholic Church in 1902. The next year she accompanied the Cisneros girls to Rome and visited the Birgitta house, which at that time was a Carmelite convent. She experienced what she came to call her “Brigittine calling”; she wanted to serve God in the Birgitta house and to work toward the conversion of the Nordic peoples to the Catholic faith. She was suffering from bleeding ulcers at this time, an affliction she had suffered since her teenage years. Despite this the Prioress of the Carmelites, Mother Hedwig, accepted her request to enter the convent. In 1904 she became a novice under the name Maria Elisabeth of Saint Birgitta. With the support of her confessor Hagen, who had just been transferred to Rome, she obtained papal dispensation to take her nun’s vows as a Brigittine sister. This exception was awarded her due to the fact that she was believed to be suffering from a terminal disease. However, Elisabeth Hesselblad recovered. In order to better understand Brigittine spirituality she spent the years from 1906 to 1911 travelling and visiting the Brigittine convents in Europe. This included Syon Abbey in England, which she came to maintain close contact with in the following years. As an oblate in this convent she was allowed to call herself a Brigittine. 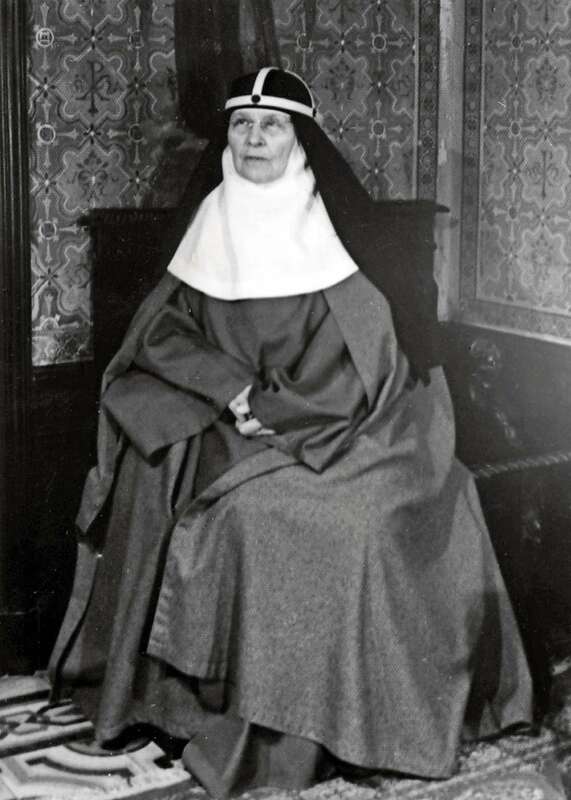 In 1911 she and two young English women established their own Brigittine community in a part of the Birgitta house in Rome rented out by the Carmelites. Whilst the medieval Brigittine order had consisted of autonomous convents, Elisabeth set up so-called congregations which were centrally run and had subordinate communities. The taking of vows occurred at the altar in St Birgitta’s room. The Brigittine community, led by Mother Elisabeth – as Maria Elisabeth Hesselblad was now known – moved to premises on Via delle Isole, which still houses a Brigittine community today. With a steady increase in the number of postulants, the enterprise grew and in 1920 this new Brigittine society obtained temporary papal approval. Elisabeth Hesselblad had achieved one of her aims in establishing the Brigittine community in Rome. Her next goal was to re-establish the order in Sweden. The Birgitta jubilee in 1923 – when the Swedish church celebrated the 550th anniversary of St Birgitta’s death – seemed a prime opportunity. On the initiative of representatives of the newly established high church Birgitta association, in particular Mary von Rosen, Elisabeth Hesselblad was invited to participate in the celebrations. Encouraged by the newly appointed apostolic deputy to Sweden, Bishop Johannes Müller, she used her stay in Sweden to establish a Brigittine community in Djursholm, near Stockholm, with the help of two fellow nun. As convents were banned in Sweden at the time the community was formally presented as a guesthouse run by nuns, whose numbers steadily increased and who alternated a life of prayer with running a boarding house. This model came to be used by most of the communities which Elisabeth Hesselblad set up, for example, in Lugano in Switzerland, Iver Heath near London, and in Vadstena, where the Birgitta sisters settled in 1935. The community which was established in Kerala in India in 1937, however, retained its focus on the contemplative aspects. This form of convent life – where contemplation was complemented by outward-looking activities – also came to be applied at the Birgitta house in Rome. The acquisition of the house followed a lengthy campaign in which Archbishop Nathan Söderblom and the Swedish state had presented powerful opposition. With the help of capable Swedish Catholics, not least Marquis Claes Lagergren and his network among the Roman curia, Elisabeth Hesselblad emerged victorious from the campaign. Her letters highlight the significance of the memorials and places related to St Birgitta to awakening the Nordic population’s interest in the Catholic faith. In Vadstena the Brigittine sisters had to make do with a building next to the ancient convent church. The return of the Brigittine nuns to Sweden reverberated in the press. Several positive articles about Elisabeth Hesselblad were published in connection with the Djursholm establishment. She was presented as a “Swedish woman of note” and a custodian of Swedish tradition. However, there was also a negative backlash. The resulting public debate revealed that the anti-Catholicism which marked the times of Reformation still had a strong grip on Swedish society. In 1942 the new branch of the Brigittine order finally obtained papal approbation along with the right to use the name Ordo Sanctissimi Salvatoris. Elisabeth Hesselblad had not actually intended to found a new Brigittine order but rather to reform and revitalise the old one and to merge the old convents with the new communities into one single Brigittine society. Her letters reveal that the more active orientation of the new Brigittine branch was rather a forced result of circumstances than an expression of an intentional plan and that she had intended for the new order to also contain a contemplative side. During the Second World War the Birgitta house at Piazza Farnese served as an asylum for Jews, and after the war Elisabeth Hesselblad became very active in supporting refugees in war-ravaged Europe. She was awarded several merits for her efforts, including Malteserordens förtjänstkors 1946. Early biographies presented Elisabeth Hesselblad as a pioneer of ecumenical dialogue. This directly contradicts the evidence of contemporary source material and of more recent research. Elisabeth Hesselblad believed that one of her most important duties was to pray for and work toward the conversion of the Nordic peoples to the Catholic faith. She also let this be known to her Protestant high church network. Elisabeth Hesselblad was not ecumenical in the way that it would be understood today. Several of the prelates and theologians who knew her and supported her work were members of the conservative camp in the church. Nevertheless the Brigittine communities came to serve as meeting places for both Catholics and Protestants, particularly women. This was very apparent in Sweden but also at the Birgitta house in Rome which once again had become a centre for Nordic pilgrims in the broadest sense. These included the actress Ingrid Bergman, amongst others. Using the memory of Birgitta as a common link the new Brigittine order became a path-breaker which enabled the Catholic-Protestant ecumenical dialogue to be established during the Second Vatican Council in the 1960s. Elisabeth Hesselblad died at the Birgitta house in Rome on 24 April 1957. She is buried there. On 5 June 2016 she was beatified. She was the second Swedish saint, following St Birgitta, to be canonised by the pope. Maria Elisabeth Hesselblad, www.skbl.se/sv/artikel/ElisabethHesselblad, Svenskt kvinnobiografiskt lexikon (article by Yvonne Maria Werner), retrieved 2019-04-24.